Evadale by Blue by Enzoani. 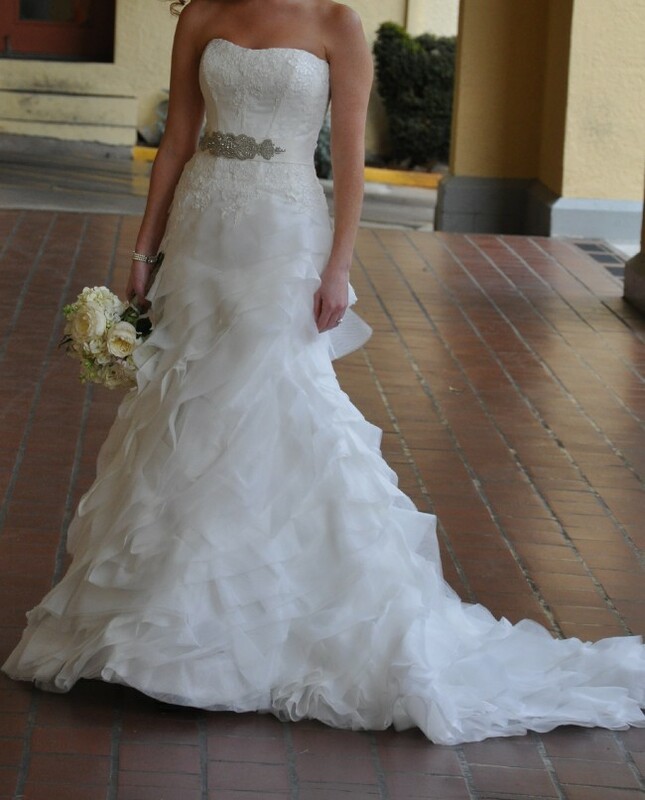 This exceptional wedding gown features a strapless and sweetheart neckline. Lavish lace covers the slim bodice and gorgeously forms your silhouette with the fit-and-flare shape gown. 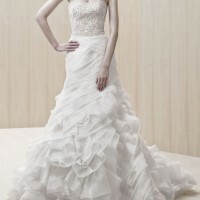 Flounced detailing emblazoned the skirt with the soft organza. Belt not included. This flattering dress is exceptional for all body types. The dress has a flowing short train that moves with you down the aisle. Each ruffle and fod move in unison so you will look like your floating down a river of love to your life partner. The train can be pinned later for the festivities. The color is considered Ivory but is actually more of an off-white. Beutiful embroidrd brocade along the torso with pearls and jewels, dance and sparkle as you enter the room. This dress is Brand New and UNWORN - Dress was purchased brand new, online but arrived to late to have it altered. I ended up buying a different dress 1 week before the wedding. Zip back can be altered into a corset back. The dress is in pristine condition, just needs a swift quick press. It has NEVER been worn. Brand New. Once you send a message, Fireman123 can invite you to purchase the dress.